An extensive range of hand made and hand printed Homewares featuring the beautiful wildlife designs of Alison Green. Alison meticulously screenprints her designs on a variety of textile products. 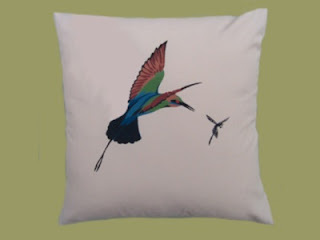 Visit her website and choose from a selection of Homewares - including Cushion Covers (Rainbow Bee-eater design pictured), Table Runners and Placemats. Ideal gift to send or take overseas.